Right now we are seeing record low gas prices, with less pain at the pump many car buyers aren't seeking maximum fuel efficiency. Since diesel can be a tough sell, fans of oil burning cars might worry that their options could be limited. BMW has announced that they are staying in the diesel game in the US for awhile. According to Ward's Auto, BMW says that fuel prices don't really impact sales, and that their diesel models continue to be popular for customers looking fora balance between performance and fuel efficiency. "Gasoline prices have never played such a role for our customers. It's not really decisive for our business...It doesn't hurt that gas prices are low, but we really don't feel a lot of impact on our business if gas prices are low or high." "It is amazing that diesel is not more popular in the U.S. than it is because really it produces actually what the consumer in the U.S. should be looking for: range and acceleration, the torque," he says. "Both (are) delivered by diesel in a wonderful way. In many cases, as far as fuel economy and emissions are concerned, it even beats hybrids." AAA reports that the national average for a gallon of regular is going for about $2.00/gal down from $3.28 a year ago. Diesel is hovering around $2.83/gal down from $3.88/gal last year. Convincing buyers to go for the diesel motor and pay an extra $80 cents per gallon at the pump is difficult when gas motors are already pushing 40 MPG. I mentioned in a previous post, the equation changes when you are shopping luxury cars that require premium fuel, which currently goes for about $2.44/gal. Now the extra 40 cents per gallon can easily be offset by the fuel savings. Diesel take rates are relatively high for BMW, compared with other brands. Between 7 to 10 percent of the 3,5, and 7 series sedans are sold with the diesel motor, while 15 percent of X5 buyers opt for the oil burner. 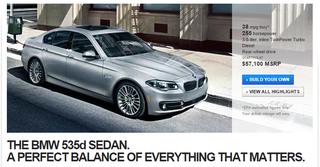 What was most surprising is that 47 percent of 3 series wagons are sold in 328d configuration. Who says Jalops don't buy new cars. BMW says diesel is here to stay; now if only they would give us a diesel wagon with a manual transmission.